for a DIFFERENT holiday experience? Discover the Barcelona that’s off the beaten track: just a few minutes from the big city there’s a whole world to explore. around rocky coves, beaches lined with dunes and remote villages where tourists never dream of venturing. Enjoy a personalised, private getaway and let yourself be captivated by the beauty of wild and rural Catalonia. In Catalonia there is a host of small villages which have remained practically as they were 500 years ago. The houses are stone-built, with solidly-constructed doorways and charming windows. Some village houses but above all many isolated farmhouses are fortified. The cobbled streets are steep, winding and shady, giving these villages an air of days gone by, introspective and filled with memories, just as if time had stopped there for hundreds of years! Perched atop a rocky hilltop, beside a dizzying cliff, set in a pass or enclosed in a glacial cirque, in Catalonia there is also a whole series of sanctuary chapels dedicated to the Virgin Mary (known as “Marian sanctuaries”). All of them have one thing in common, that according to their respective legends carved wooden statues of the Virgin Mary were found by some shepherd thanks to the help of an animal, often an ox, and these figures are worshipped there. Devotion to Our Lady has always been widespread among the people of these areas. Statues of this kind, carved according to a similar pattern, proliferated from the late 11th century, reaching their peak between the mid 12th and mid 13th centuries. The outing is tailored to suit you, alternating – as you prefer – visits to chapels with walks around little villages where time seems to stand still. Journeys by vehicle are combined withwalks to take us to the chapels, where we can enjoy stunning views with much of the country lying at our feet. We will also stroll through steep, shady streets in villages which have withstood today’s pressure to become the same as everywhere else. Your guide is an expert in the history and art of the chapels and ancient villages who is also highly knowledgeable about the geography, flora, fauna, habitats and traditional and modern uses made by people of the land in the area you are about to discover. Dolmens, standing stones and other types of megalith (prehistoric structures built with large stones) are often associated with misty Atlantic regions with imposing sea cliffs topped by meadows, pastures and moss-carpeted oak woods… The image is true enough but incomplete. The megalithic monuments of Europe are spread through Ireland, Wales, Scotland, England, France, Portugal, Denmark, Sweden… and Catalonia too! It is here in Catalonia that they are to be found both beside the Mediterranean sea – among vineyards, scrub and scattered woodland – and away from it, inland, among fields of cereals and oak woods. The north of Catalonia is very rich in these monuments of a ritual and funerary nature, often surrounded by an aura of magic and mystery. The outing is tailored to suit you, bringing you to the part of the country with the most and the oldest (3,500 to 2,200 years before Christ) dolmens – as ancient as the oldest structures in the Atlantic regions. By combining short walks with journeys by vehicle we will take in the main clusters of dolmens and other megaliths in the area. We will be walking through an open, panoramic countryside, enjoying all at once the captivating blue of the sea as a backdrop to lonely coves and cosy bays, ancient villages of white fishermen’s houses, Romanesque hermitage and sanctuary chapels where time seems to stand still and the scrub which in springtime splashes this wonderful landscape with bright colours. Your guide is an expert in megalithic culture who is also highly knowledgeable about the geography, flora, fauna, habitats and traditional and modern uses made by people of the land in the area you are about to discover. Catalonia is one of the most mountainous regions in Europe. The diversity of its mountain landscapes (Mediterranean, central European and alpine), of the forms of its relief (spires, volcanic craters, round-topped hills, sheer cliffs, jagged peaks and more) and its rocks (volcanic, limestone, conglomerate, slate and so on) create a visual attractiveness and a contrast of colours and shapes which is unmatched in Europe. On walks within a short distance of Barcelona you can admire the unparalleled spires of Montserrat, go into one of the 40 volcanic craters of La Garrotxa, climb up to the dizzying cliffs of Collsacabra, scale peaks 1,700 metres (5,500 feet) up in the Montseny hills, just 15km (9 miles) from the sea, stroll through the Mediterranean woodlands of the rounded Montnegre or Collserola hills, enjoy treading the carpet of grass covering the Montgrony mountains, which rise to nearly 2,000 metres (6,500 feet) or even, if you are fit, climb to the rocky roof of Catalonia, 2,500-3,340 metres (8-10,000 feet) up. Walking along as you breathe in the intense smell of the Mediterranean herbs, the damp of the mosses in the stream beds and humid beech and oak woods, or being dazzled by the explosion of colour of the alpine flowers – a treat for your senses! Views which will remain imprinted on your memory for ever. The outing is tailored to suit you, in terms of length (half a day, a whole day or several days), difficulty (hours walking and accumulated climbing), going (rocky ground or level, grassy ground) and type of relief (spires, cliffs, round hills, jagged peaks, etc.) and, of course, the chosen location (Montserrat, Montseny, Montnegre, Cadí-Moixeró, Collserola, etc. Natural Parks). Everything is carefully planned to make sure the trip fits what you want like a glove. Your guide is an expert in mountaineering (a member of the national federation) who is also highly knowledgeable about the geography, flora, fauna, habitats and traditional and modern uses made by people of the mountains of your choice. Catalonia is an exceptional place for birding enthusiasts thanks to its privileged geographical position – a stopover place for many migrant species – and its wide range of habitats, ranging from mountains over 3,000 metres (10,000 feet) high to river deltas by the sea, and including steppe, Mediterranean woodland and scrub, central European woodland and more. It is in fact one of the few regions of Europe where, despite its small land area (32,114km2 or 12,400 miles2, similar to that of Belgium), all three major units of European natural landscape are to be found: Mediterranean, central European and alpine or boreal. This is why it contains many of the habitats which exist on the continent, and therefore birds of all kinds which find ideal conditions for breeding, wintering or simply stopping to eat and rest on one of their journeys to northern Europe or to Africa: steppe, uncultivated land, dryland cereals, coastal fresh water and salt marshes, inland lakes, Mediterranean scrub and woodland, deciduous forest, temperate subalpine coniferous forest, alpine grassland, beaches with dunes, imposing sea cliffs, soaring crags… a wonderful mosaic of habitats which are home to a richness in bird population which is unmatched anywhere else in Europe. By way of example, as many as 395 species of birds have been spotted in Catalonia, of which 232 breed here and 206 winter here regularly. Moreover, it is the only region in Europe where the four species of vulture (black vulture, bearded vulture, griffon vulture and Egyptian vulture) can be seen practically in the same place! The bird watching trip is tailored to suit you, in terms of length (half a day, a whole day or several days), target species for observation (little bustard, bearded vulture, purple swamphen, Audouin’s gull, black wheatear, etc) and habitats (steppe, dryland, deltas, wetlands, Mediterranean scrub, cliffs for raptors and so on), as well as Natural Parks to explore (the Aiguamolls de l’Empordà, Cap de Creus, Garraf or Delta de l’Ebre parks, for example). Everything is carefully planned to make sure the trip fits what you want like a glove. By combining short walks with journeys by vehicle we will discover a whole series of Iberian bird species while walking beside sheer cliffs, through wetlands dotted with colourful yellow irises, around the edge of a field of cereals or coming upon lonely coves with the captivating blue of the sea as a backdrop. 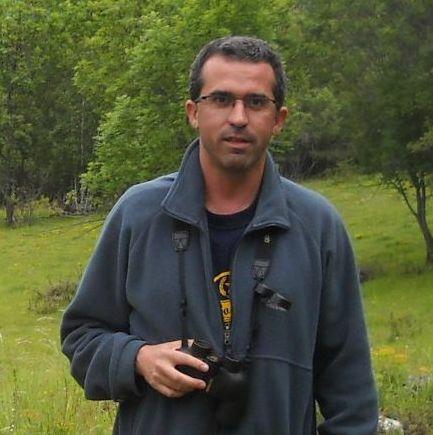 Your guide is an ornithologist with over 20 years of experience, a member of the Catalan Ornithological Institute, in joint charge of the project to reintroduce the peregrine falcon to Barcelona (www.falconsbarcelona.net), joint designer of the first on-line census of house martins (www.orenetes.cat) with wide experience of fieldwork (working for the Atlas of Breeding Birds of Catalonia, the Atlas of Wintering Birds in Catalonia and others) and of leading bird watching trips. He is also highly knowledgeable about the geography, flora, fauna, habitats and traditional and modern uses made by people of the land in the area you are about to discover.